A Tory landslide: mission impossible? Many of the easiest ones to win back are seats they lost at the last election, which make up almost half of their first 20 target seats. Theresa May will be hoping that she can overcome the reasons why they were lost only 2 years ago. The most fertile areas of potential gains for the Conservatives are the North West, West Midlands and Wales. 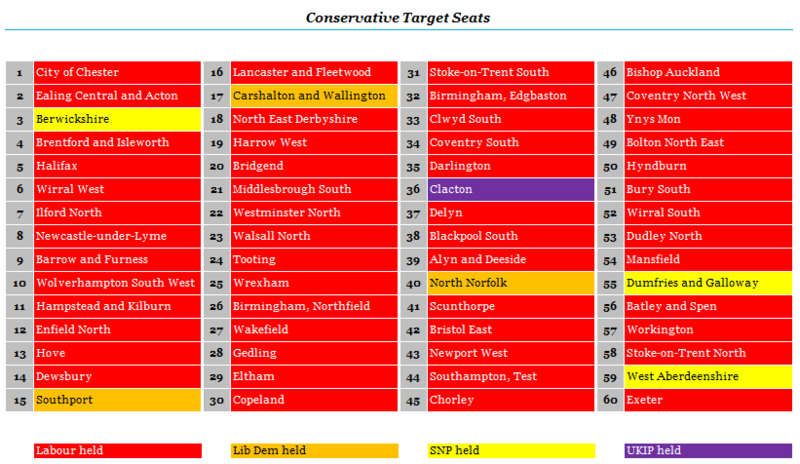 Half of their target seats are north of the Severn and west of the Pennines. There are ten potential gains in London. However, young professionals are the key demographic group in London and there is little sign that they are moving into the Conservative column, so we don’t expect a large amount of progress for Mrs May here. 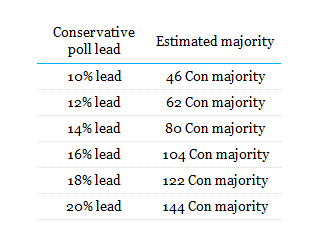 A healthy Conservative lead of 12%, in line with our March poll, could see the Conservatives reach a 60-odd seat majority. But that still seems quite slim, considering that it’s comparable to Thatcher’s lead in 1987 which resulted in a majority of over 100. This is partially as a result of Scotland becoming almost irrelevant in terms of boosting the seat numbers of the UK-wide parties, and partly due to the divergent voting patterns in 2015 that saw most Labour and Conservative incumbents increase their majorities. And this of course could all be dampened by the Conservatives losing seats to the Liberal Democrats – any majority dependent on twenty gains from Labour could be seriously dented by ten losses to the Lib Dems if Theresa May is unlucky. Outside of London, the Tories already had a strong lead over Labour at the last election. Many of the English seats the Tories haven’t held since the 1980s have already been retaken by Cameron. Whether or not the Tories can break entirely new ground in the north will be the key to unlocking her landslide. The Conservatives have never won almost a quarter of these target seats (14 out of 60) at a general election, or at least not in living memory**. Many of them are marginal as a result of recently volatile voting patterns and the UKIP intervention in 2015, and what will happen in these seats is anyone’s guess. But it is mainly as a result of these being in play that Theresa May’s landslide will be won or lost in the decaying urban areas of old industrial England. * Seats are colour coded according to who won them in 2015, hence Copeland remains in red and Clacton is referenced as being UKIP held. ** Seats such as Copeland, Walsall North, and Workington, have been won by the Tories in by-elections since the War, but have not yet been won in a general election.